I like to look at FX Triads to keep my analysis honest (or at least to identify where something doesn't look right). Not always easy to assess, especially when the two main sides to the Triad (in this case EUR/USD and GBP/USD) are going the same way. 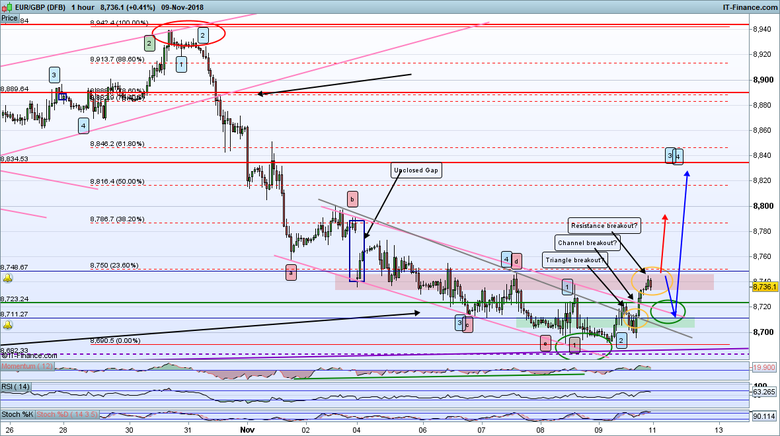 I am looking at EUR/GBP with a contrarian bias (Warning! I have a bias here but at least I recognise it...) in that I believe the majority view that Brexit is doom for the UK to be misguided. 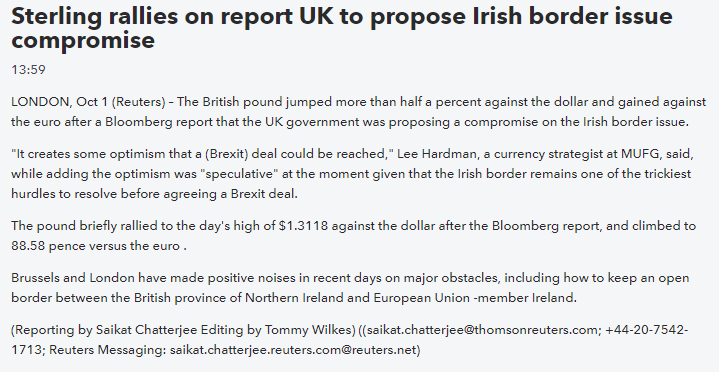 People will point to GBP/USD as proof but I believe this will turn out to be confirmation bias as if you also look as USD across the board you will see USD strength and others do not have Brexit issues to contend with (EUR, CAD, Yen, etc. etc). Anyway back to the only data that matters to me, price action. On the weekly chart I have a very strong Triangle consolidation formation since the 7 Oct 2016 market top, which I believe to be a wave B top leading to a strong Wave C Bearish move (check out a Monthly chart to see this more clearly). The alternative assessment, aligned to the anti-Brexit viewpoint, is that the Euro will charge up against GBP and that this Triangle consolidation is building toward this move but I find it hard to see such a strong move against GBP if the Euro also drops heavily against USD. Either way when there is a breakout of this Triangle it will be a trading opportunity, especially if it is to the Bearish side (more potential points in that scenario for me). Looking at the Daily chart I see a Flag formation (blue lines) that has been broken and now the market is seeking to retest that Flag resistance. It is possible that this has happened already on Friday 21 Sept (my Brown A label) but I believe we will see another rally to the Fib 76/78% area where it intersects with the lower Flag trend-line to complete an A-B-C retrace. If we see a rebound back off this area of resistance then a Bearish move could be on. This could coincide with a rally in both EUR and GBP vs USD (as I have indicated in other posts is my assessment) OR a full on Bearish move in both cases with EUR getting hammered faster and harder (trade wars anyone?). Looking at the Hourly chart I see a potential A-B retrace completion with a breakout of the upper tram-line. 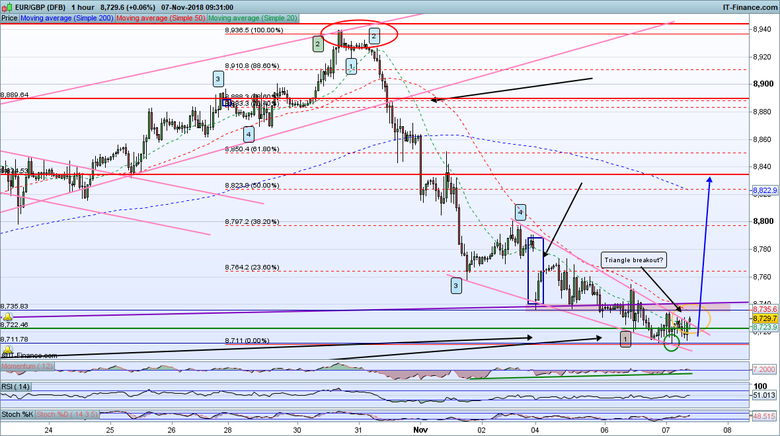 If you like to trade short term there could be 100-150 points on offer here. I prefer to keep my power dry for the Short side of this market, unless the breakout from the Weekly Triangle is bullish of course but in that case I would seek better market opportunities elsewhere. Anyone have any thoughts to offer on this market? I'm really very keen to hear challenges especially. Short term looks like it's been "flagging" with a potential H&S reversal forming. Longer term supply & demand zones shown. The Europeans are very good at creating situations that impact the Euro - Italy being the latest. Through in brexit and there is more uncertainty ! Thanks @elle I tend not to use H&S in lower time-frames myself and even in higher time-frames only with certain conditions and so hadn't seen that but I take your point, especially if you also look at the recent up/down as a higher high (just) and higher low, so it all seems to stack as a bullish move set up (at least ST). And with GBP and EUR turning down again, and if my assessment that EUR will not fall as far as GBP in this move, then EURGBP should rally. I would like to see a firm jump soon to confirm. 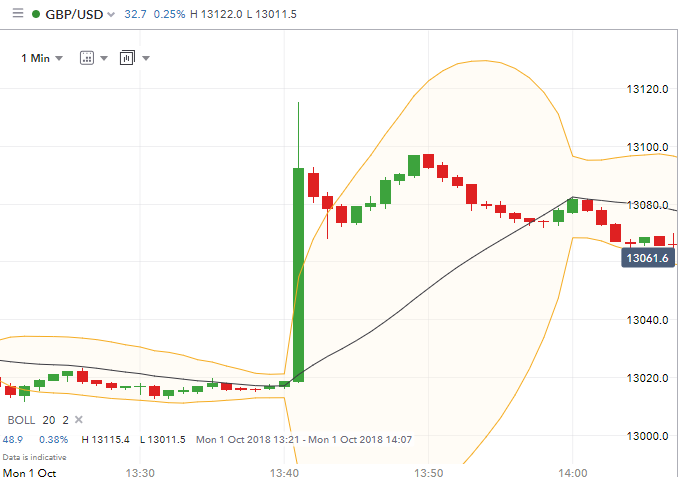 100 pips in a matter of second! Nice. I can tell you, being Irish myself, that the hard border issue is a total non issue. There has never been a hard border on the Island of Ireland, even during the worst of "the troubles". How can there be when you can walk across a field from the South to the North and not even realise it? This is an issue that has been created purely as a negotiating position in the Brexit "talks". What both sides really need is a dose of pragmatism but these are politicians so don't bet on that any time soon. Cue a down to the wire game of chicken with either a last minute deal pulled out of the fire (which will be curiously well prepared and ready to implement...) or a no deal exit, which will be worse for Europe and the UK both economically but especially politically (in my opinion). Are we seeing a EURGBP tramline breakout and retest? 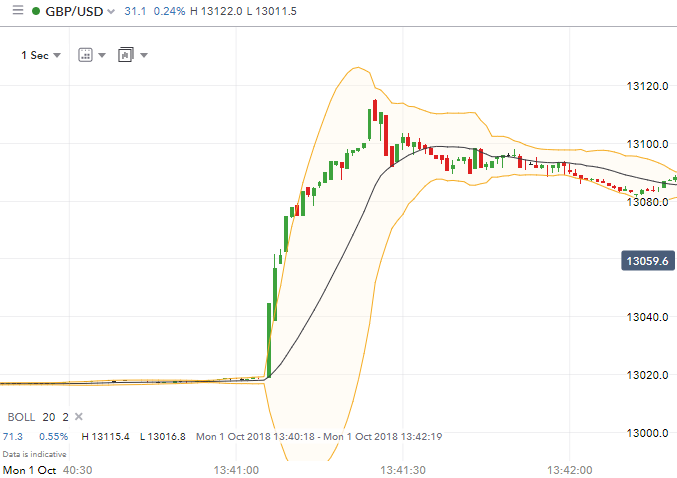 If so this offers up a sharp rally opportunity and we should also be seeing a related drop in GBPUSD as this pair follows the earlier moves of EURUSD and AUDUSD, which is exactly what appears to be happening right now. If anyone is trading EUR/USD or GBP/USD it may be worth noting that EURGBP has just rallied away from a long term supporting trend-line with PMD on 4 and 1 hour charts. I expect a period of GBP weakness for a while until the EURGBP bear resumes. For both EURUSD and GBPUSD this just means that GBP would come down further in the short term as both are trending down at present. BTW, I should add, whether we see a retrace on this pair or not, which is debatable, a firm break through the LT trend-line support is an interesting time for Short trading. 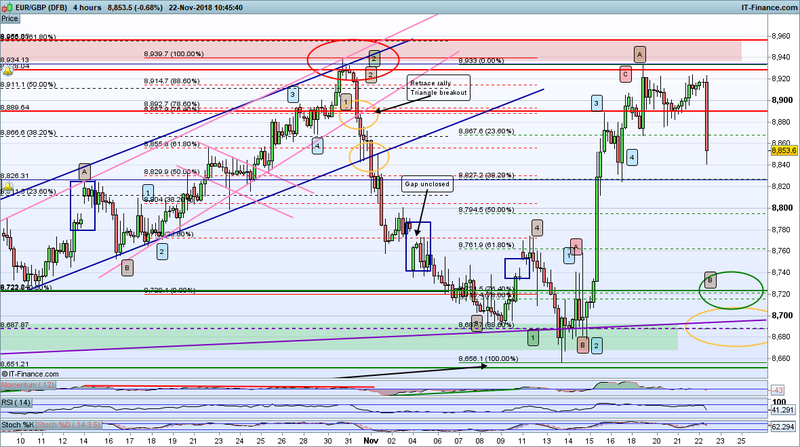 Watch out for a break and retest through. Best set up is a retrace as per my blue arrows on the chart but a break-through of LT support is also a good point to consider a trade. 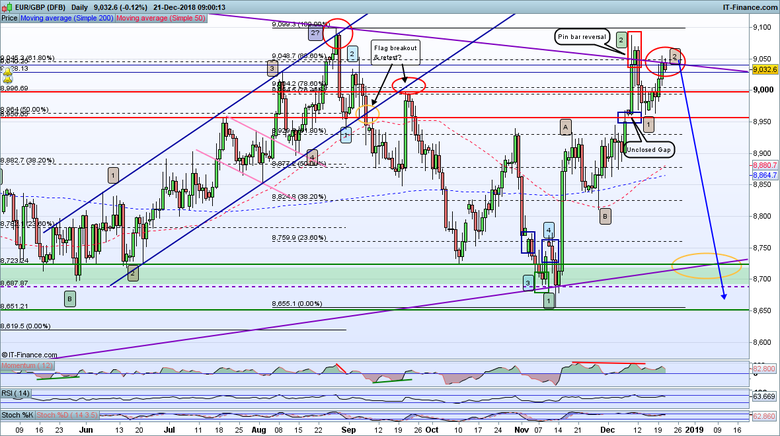 A word on the EURGBP Triad with everyone focusing on stocks and USD it is easy to ignore the third leg of the Triads. I think this one in particular has a lot of points to offer (and already has for me - warning I am Short this market so I have a bias for that to continue). As previously posted, I am taking a contrarian stance here, in that I believe GBP will be stronger than EUR against the USD, although both will suffer. I have a Strong Triangle formation on the Weekly chart, which has been poked through to the down side this week (not yet a confirmed break out though. I think this is a long Wave 3 motive Bearish move and, if right, I am expecting some retesting of the Triangle bottom line, maybe in consolidation phase before a resumption of the bear move down, which would be quite fast and hard. There is a chance of a so-called hard retest (or fake breakout) and return to Resistance around the 8850 level within the Triangle. This would then be a point where either the Bear resumes and an eventual Triangle breakout occurs later OR the Triangle consolidation continues on up. 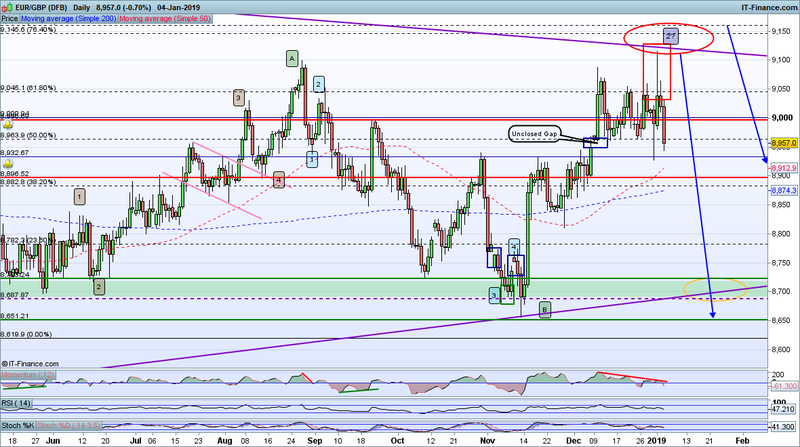 As I expect EUR to play catch up on GBP in the coming days the retrace fits but not sure for how long until both GBP and EUR complete there respective retraces vs USD. For EURGBP to go full Bear either GBP must retrace further and faster than EUR and/or then EUR bear is worse than GBP. If I am right there is 4000+ points on offer on this market. Hourly chart breakout of a potential ending Triangle at Wave B (and double bottom). Potential ST retest in progress. Good PMD and LT trend-line support. 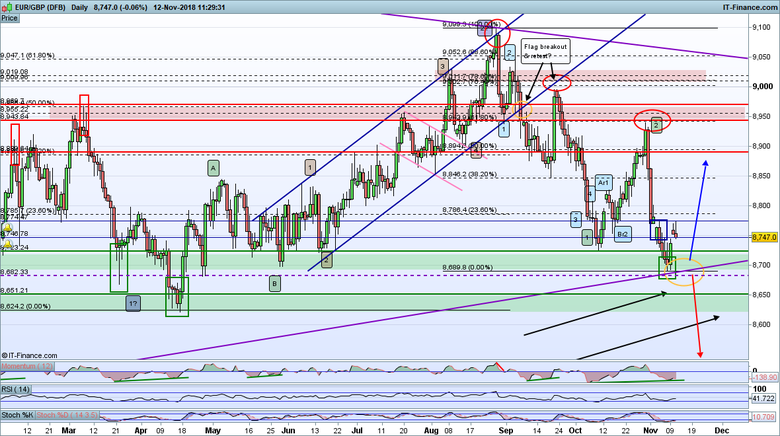 A break away rally from here suggest a decent run up in retrace (or within the Weekly Triangle consolidation). Downside risk is curtailed by the previous low (the other part of the double bottom) as a break below suggests a major Bear market is in the offing. More importantly for now, with both EUR and GBP falling at present, it supports a fairly decent drop in the GBPUSD pair, which fits with my road map projection for that market. 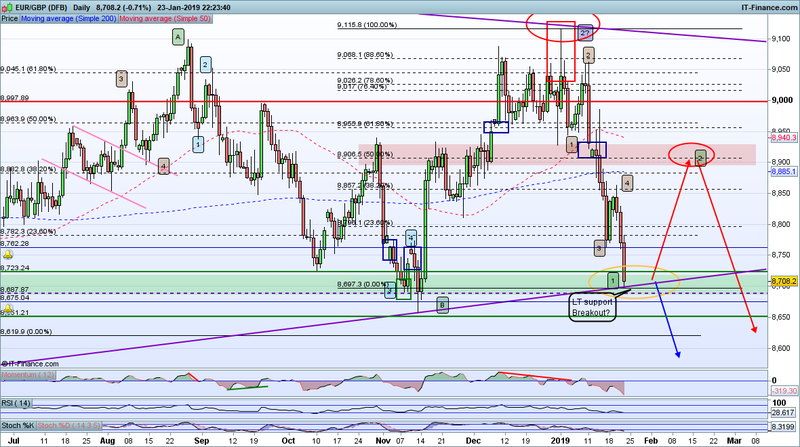 The Triad is worth watching if you are trading EURUSD and/or GBPUSD at present. If my road map for GBPUSD complex retrace scenario is right and EURUSD is simultaneously set for a straight forward rally then EURGBP should go up. My last post (above) was suggesting this exact scenario. That one broke down but I now have another similar, but better, set up that is poking it's head above the triangle line. I'd be looking for a firm breakout through over head ST resistance to trade this (note I am not trading this market Long, only Short LT). The market appears to be making another attempt to breakout of the Triangle consolidation, which I think is an ending triangle for the short term bearish move (it conforms to the classic EW a-e wave motion for such). There was a strong bounce off the lower line in the last hour. 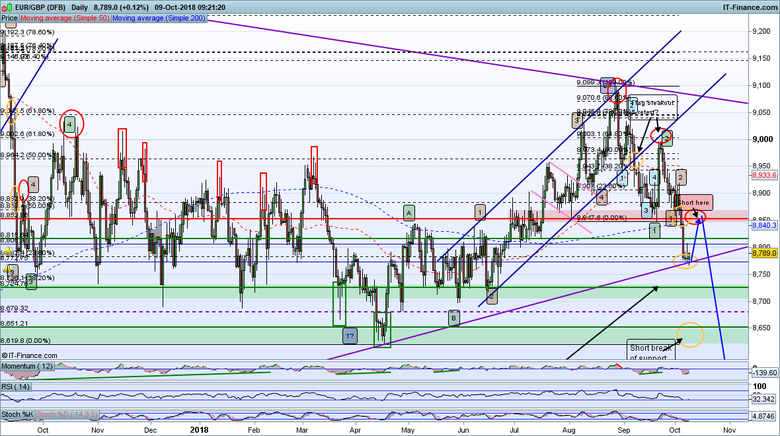 A breakout through the upper line and over head ST resistance would be Bullish in my view. I am not trading this pair Long as my big picture assessment is for a significant Bearish move to come once the long term Triangle consolidation is broken. I am however watch it to support my assessments on GBPUSD and EURUSD. A bullish move here supports divergence between GBP and EUR directions or at least greater strength in the EUR move if both rally. Clearly the key point with this pair is in which direction the Triangle gets broken in the context of the other 2 legs of the Triad. Looks like this market is making an attempt to breakout into a rally. I have a LT support trend-line, which is the lower line of a very large Triangle consolidation (if and when this is broken, well look out below...) For now price remains contained within the Triangle and has just rallied back off the line with a pin bar action on the Weekly. On the hourly chart we can see a break of the small ending Triangle AND the channel line (if that proves more reliable) and is now testing the immediate overhead resistance zone. I would no tb surprised to see price drop back from here at the first time of asking and retest the breakout zone before rallying away strongly. Such a move could coincide with a EURUSD rally or a GBPUSD fall or both, which fits my set ups on both of those markets (doesn't mean it will happen but good likelihood is higher if the Triad set ups are aligned). That hourly move does look like much but when you look at it on the Daily it does seem like a health rally move. Decent PMD on Daily, 4hourly and hourly charts. I am not trading this market long, just using it to support my EUR and GBP analysis. I m actually Short this market from the last Triangle top line bearish move and will only add to Shorts as and when. However we could see either a retrace to about the 8800 or 8900 level OR another test of the upper Triangle line (9000 ish). I am inclined towards the former but that is because I have a Short bias... If I were to trade I would have gone Long on the Triangle breakout with close stops and might go Long again either on a failed retest and rally or a break of the over head resistance. Watch EUR and GBP vs USD as this move develops for clues. So this market did indeed make a break for a rally through both the Triangle and Channel set ups but has been stopped at short term resistance and is likely to make a retest of the breakout zones before a stronger rally. 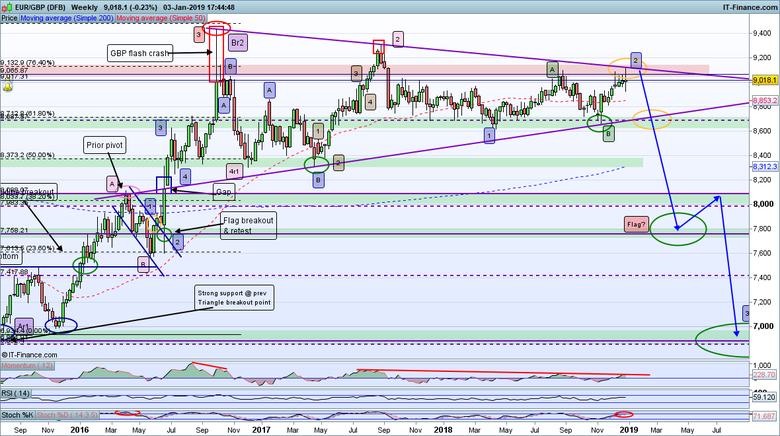 With the Euro presenting weakness one cannot rule out a break through the lower long term support line (Weekly chart Triangle set up) and I am biased towards that but perhaps not just yet (time and price action will tell). 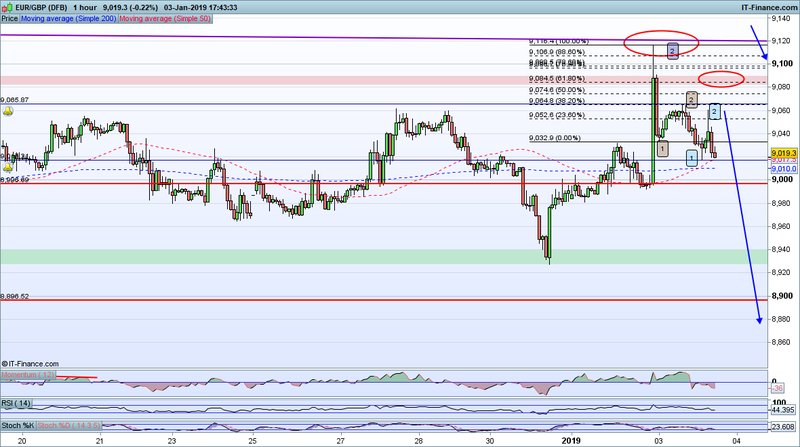 For now, on the 1 hour chart, I see a retrace and retest of support. I also see that near term price gap has not yet been closed. Therefore my leaning is towards another rally through the near term resistance. If this happens then either GBP will be dropping faster than EUR or EUR & GBP will turn and rally but EUR faster and harder. As I currently see GBP (and AUD) rallies as more likely I conclude that EUR will rally hard, but need to watch GBP and AUD for correlation turning points and also this cross pair (EURGBP) for similar correlations and of course EUR price action. 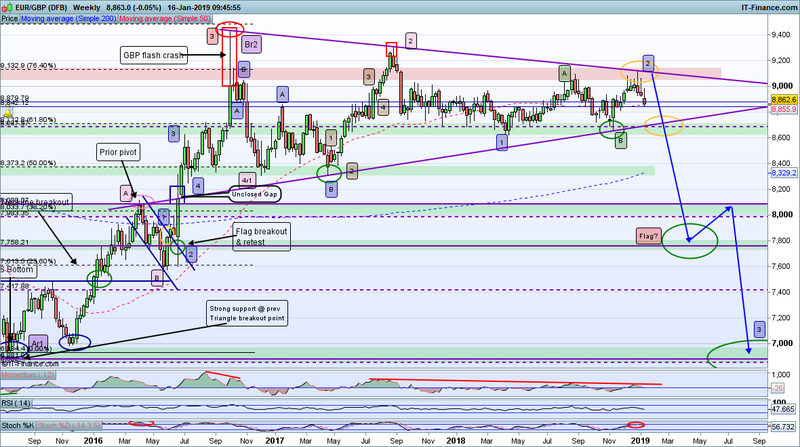 My problem with trading EURGBP Long is that it doesn't fit my long term prognosis (therefore would be counter trend trading, which is inherently more risky) and also would be trading within a consolidation zone, which is fraught with difficulty and whiplash moves as Bulls and Bears slug it out. Therefore on EURGBP I will continue to watch for an indication that the long term Bear I am projecting is occurring to get Short and for correlation confirmation for EURUSD and GBPUSD. Breakout rally was curtained and the pair put in a new lower low (marginal but still lower). 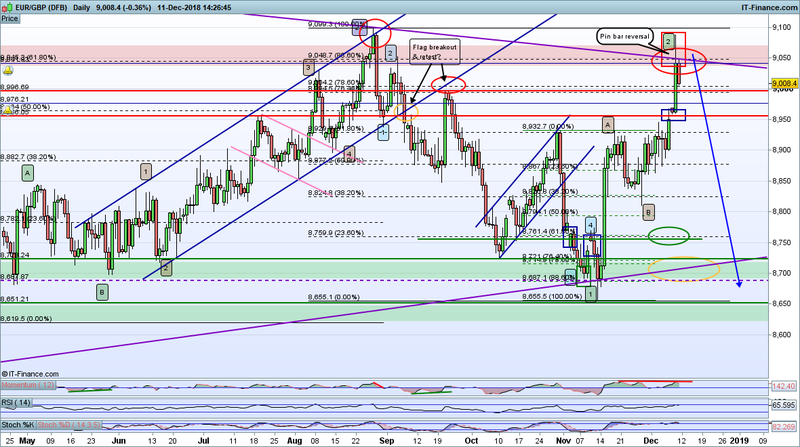 Now testing the LT Triangle lower line and the Monthly chart FIb 23%. 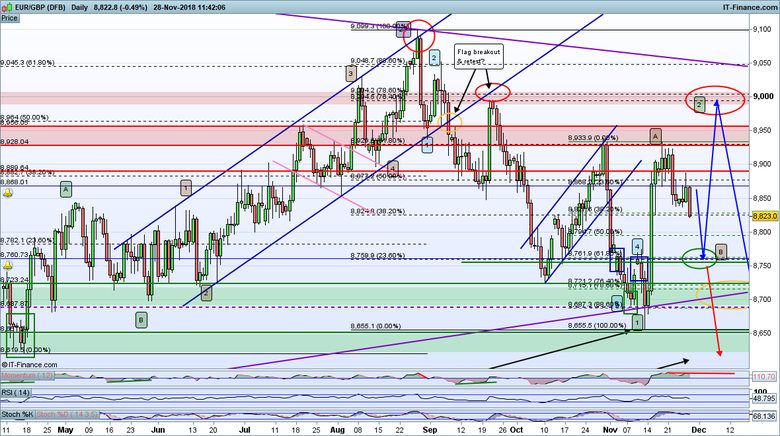 I would not trade a Short here until I got a confirmed break on the Weekly chart. An unclosed price gap remains above and both GBP an EUR have been rallying of later. 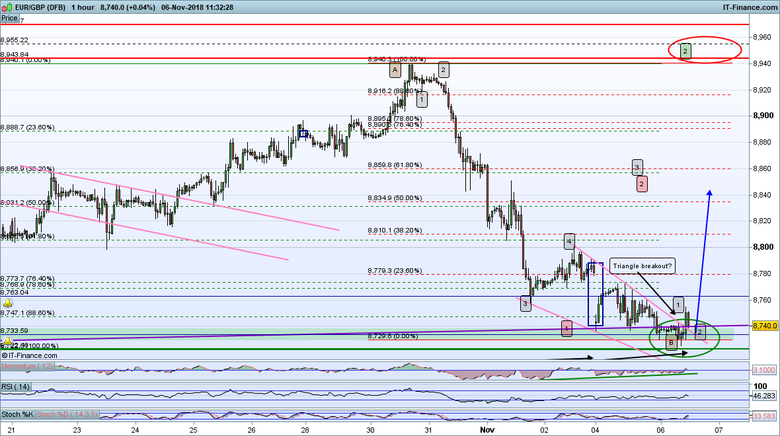 Remains to be seen but my set ups still show EUR as having more distance to rally. 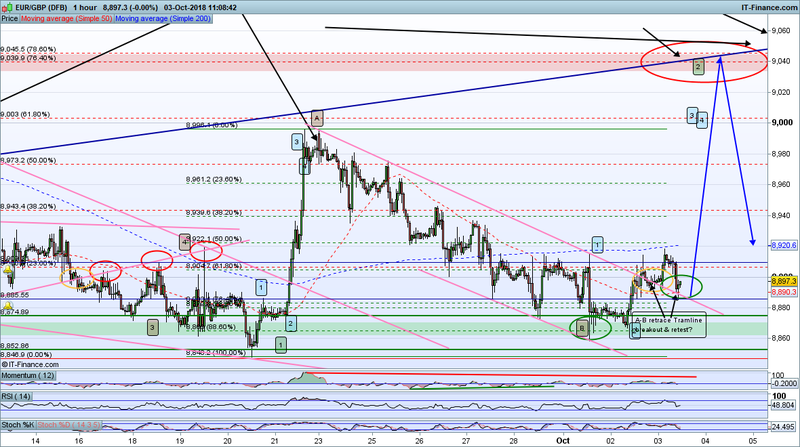 I will continue to watch EURGBP for clues for the primary pairs and for a potential Short campaign. 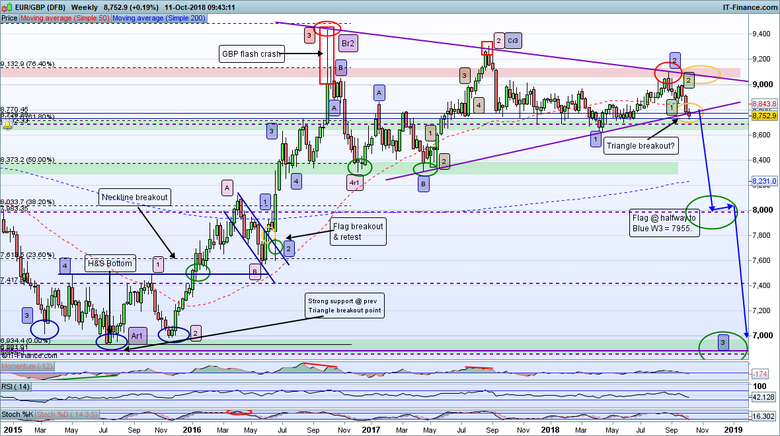 So eventually this pair did indeed rally strongly but now it looks like a retrace at least is underway (cue a period of GBP strength). 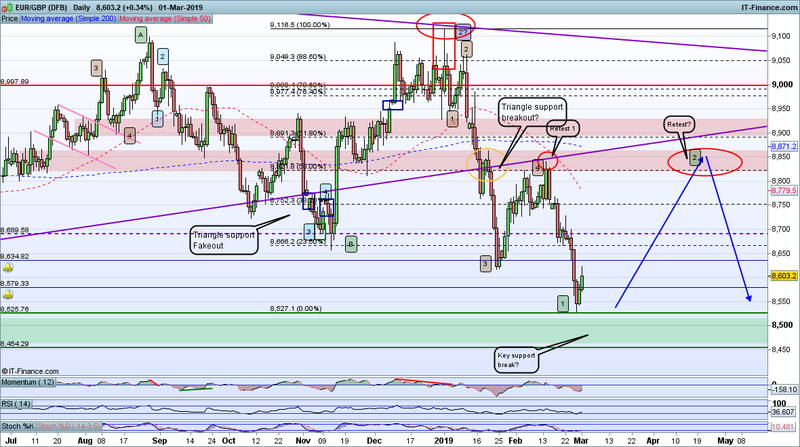 This is interesting because it supports my current assessment that GBPUSD will Rally while EURUSD may still have some bearish work to do before it then rallies. 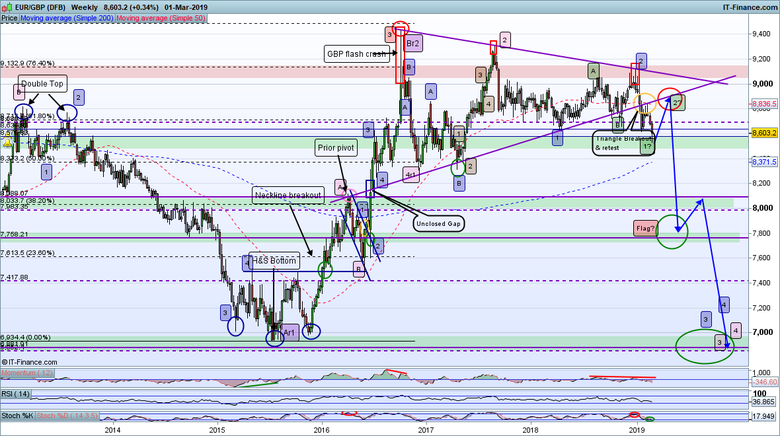 AS for a long term prognosis for EURGBP, well we will have to wait for a breakout from the Weekly chart Triangle consolidation, which could take some time. I suspect we will need to see the end of any counter trend rally action on EUR and GBP first. 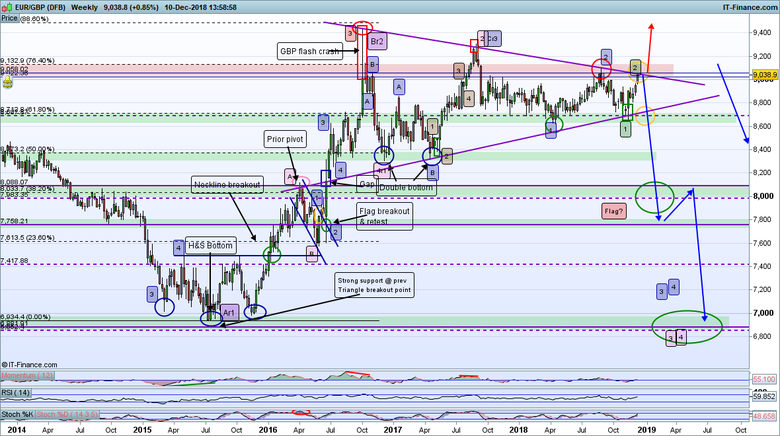 I am anticipating a short term period of GBP strength vs EUR, which may then reverse (or may carry on through the long term support but less likely for now I feel). This is manifesting in a GBPUSD rally and breakout to the upside just now (which I have traded Long) while EURUSD remains bound inside consolidation at support zone. 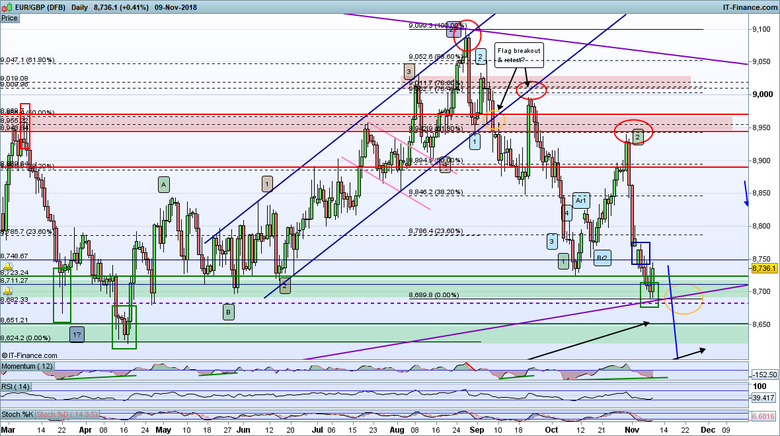 If the below chart is right then GBP is showing the way for EUR to follow in due course. 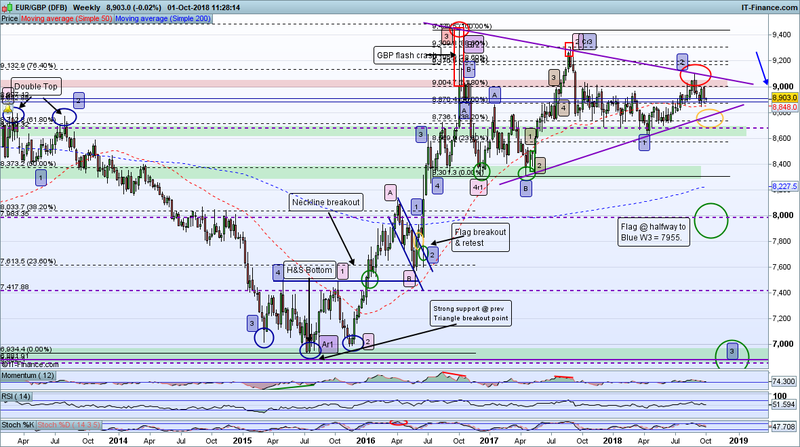 Big picture I am still projecting the Euro to collapse vs both the USD and GBP but for now we may very well see a last gasp retrace before a breakout of the Weekly chart Triangle to the down side. Clearly, from a technical perspective, there is a scenario for a breakout rally from the Triangle also but unless or until it does my lead long term scenario is GBP strength vs EUR (eventually!). 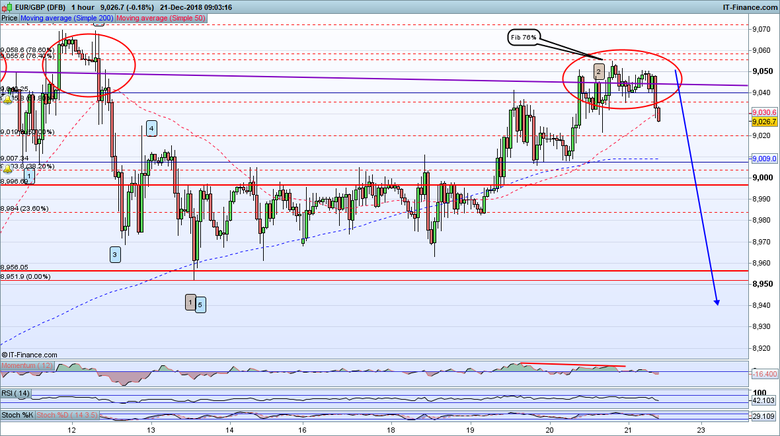 Moment of "Truth" for EURGBP (or week of truth at least...). 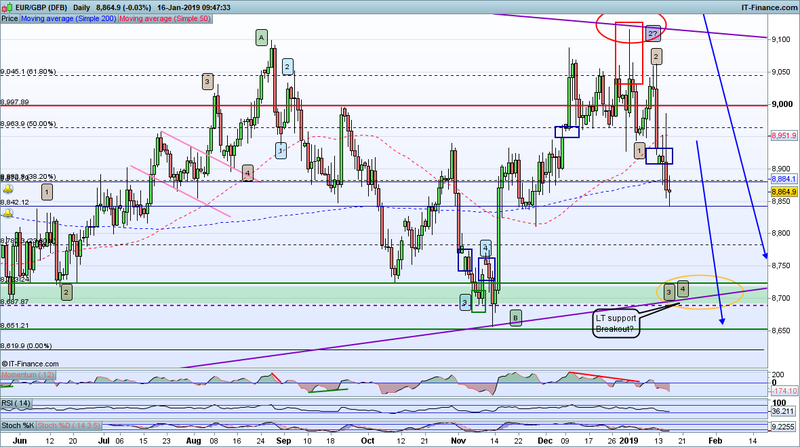 Will GBP get a shot in the arm or will it keep on falling? While the other markets sort themselves out (USD, precious metals retrace? 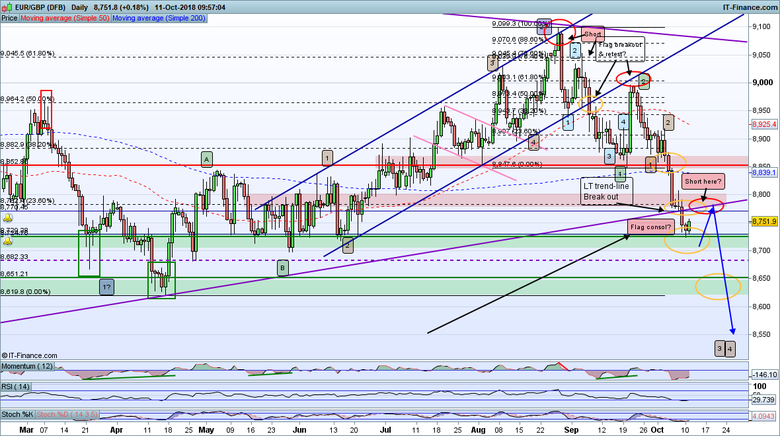 Stocks which way short term) I was drawn to the EURGBP market as it has been at a critical juncture for a while. Having rallied on cue from the lower long term Triangle consolidation line to the upper one the question became would it break out up or be pushed back. We have now had 2 repulses, the recent one last night/this morning. This market looks to me to be heading into a Bearish phase, as least for now. Oh and for the avoidance of any whining, I am Short at the Turn. Looks like my upper Weekly Chart Triangle line was drawn too aggressively initially but now looks better with the latest top, courtesy of the Flash move last night. It seems to me that GBP, having fallen harder than EUR, is now poised to rebound faster. The third leg of the Triad is certainly indicating this to me. IF my Triangle formation holds resistance then price should travel back down to the lower line and then we will see if we get a breakout. It probably will not travel straight down however and the breakout may not come until the retraces on the 2 major pairs is done with. At this point I anticipate the Euros goose will be cooked and it will fall harder and faster than GBP, for a number of fundamentals reasons previously discussed elsewhere. From a Technicals perspective I have a good pair of Triangle lines with 3+ touches (the lower line having a so-called prior pivot - the pink circle - and bisecting a price gap that is not closed at present). @elleshould enjoy that one... I also have very strong Neg Mom Div at the most recent top after an A-B-C retrace form with Stochastic over bought. 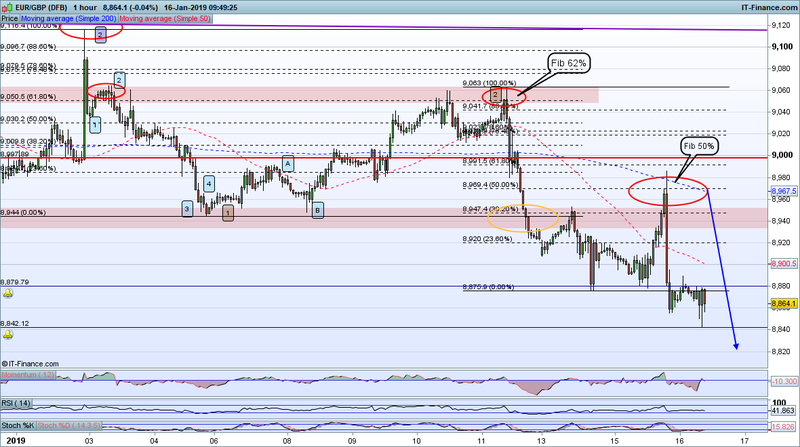 On the Hourly chart we can see the flash move spike and drop, followed by a pair of 1-2 retraces and now a lower low. I will want to see 9000 broken and eventually 8900 to be fully confident that price ought to retest the lower Triangle line but anticipate a few swings between then and now as both EUR and GBP rally. 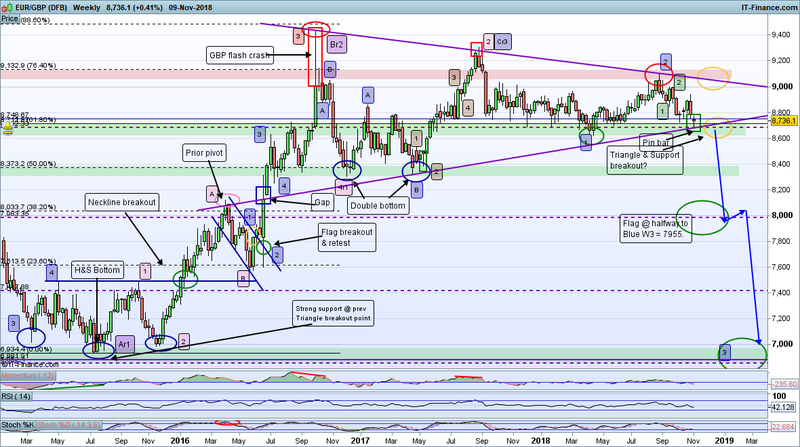 EURGBP has indeed turned well off the upper Triangle (Weekly Chart) resistance and put in a nice pair of 1-2 retraces before falling fairly hard on the back of EUR weakness and GBP relative strength after the flash spike low and US NFP price action. 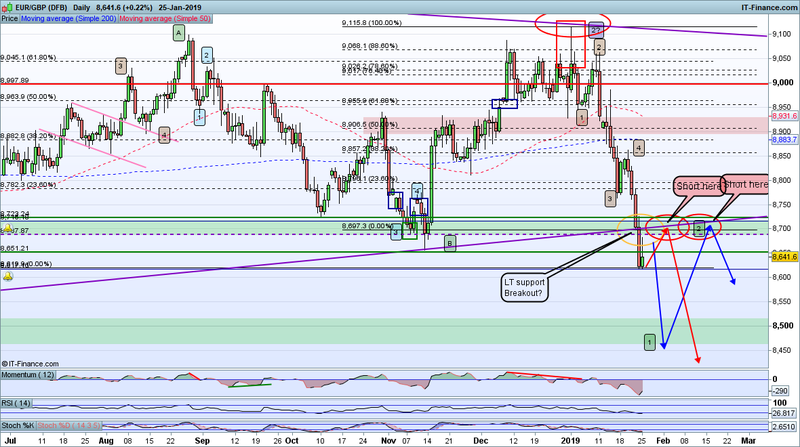 As mentioned in both my EUR and GBP posts, we would see a short term retrace on this pair coincident to a rally on EUR and retrace on GBP before the Bear gets going again. 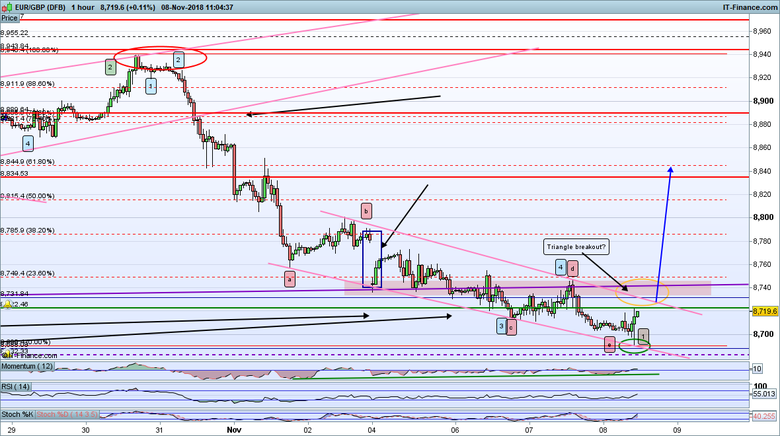 If this pans out on EURGBP then we could see a stronger rally on GBP than EUR. I am short from the 1-2 retraces and will seek to pyramid this pair when and if I see a breakout through the lower Triangle line. As mentioned before there is an unclosed gap on the Weekly chart around about the 8100 level, which is well below the Triangle support. Since my last post price did indeed rally (hourly chart), however it did so in a more protracted form causing me to reposition my EWT labels. 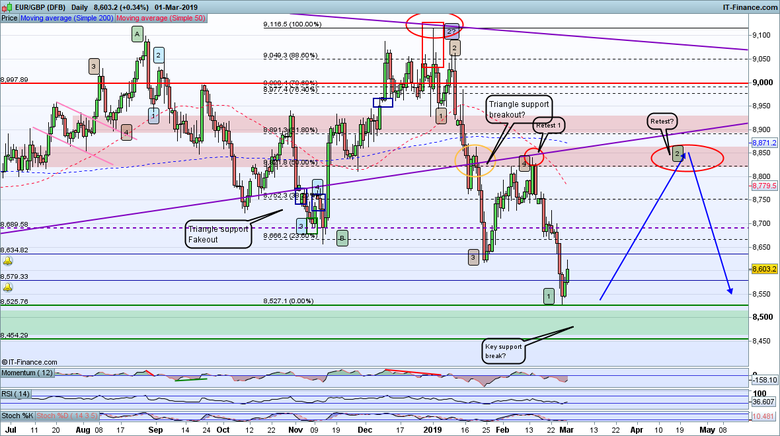 The Fib 62% was hit with a nice ST double top and then the Brexit deal vote caused a bit of ST volatility and hit the Fib 50%, spike to almost the 62% before resuming its Bearish trajectory. If we look at the big picture, taking fundamentals aside (my overriding fundamental is that the Euro has way more headwinds than the Pound and outside the EU Britain will have its destiny in its own hands, investors will like that in troubled times - of course the USD will be king so GBPUSD will go down too) that large weekly chart consolidation dominates everything. 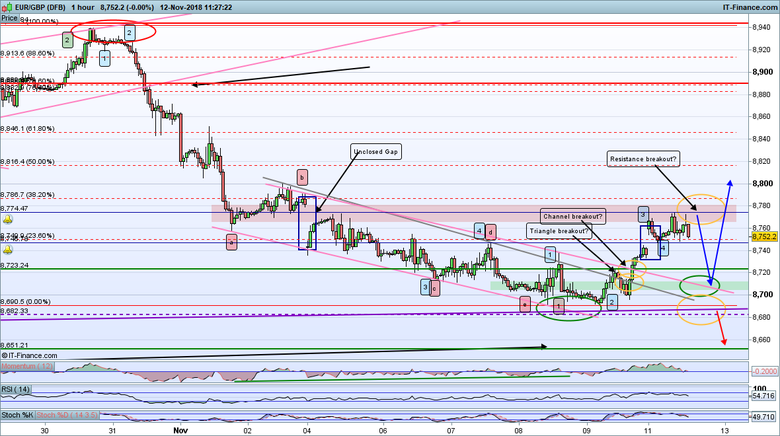 The breakout from this formation, whichever way it goes, will be key. For me, if it was going to break north it ought to have done so at the last time of asking. Now that price has been firmly repulsed back down from this resistance zone I expect at least a retest of the lower line support zone, if not an actual break out. It is quite possible we may see a failed test and rally in EWT 1-2 form within the Triangle and if this turns back down without a retest of the upper resistance zone then a breakout bear market will be on the cards. I suspect this will play out over the course of the next 3-4 months to early Summer in line with the EURUSD and GBPUSD retrace rallies and the stocks and bonds retraces. 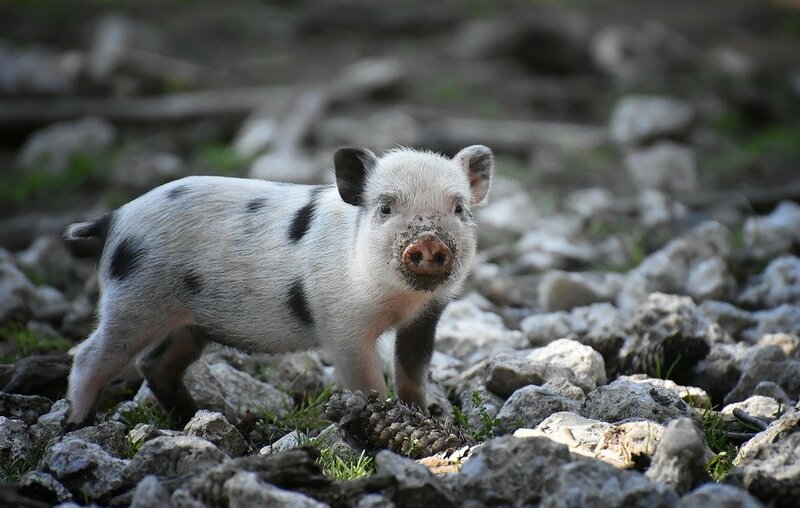 I am currently targeting early Summer (sell in May and go away type of thing) for all of this to resolve into long term moves. Therefore my strategy is to be cautious and conserve my ammo for this big event. 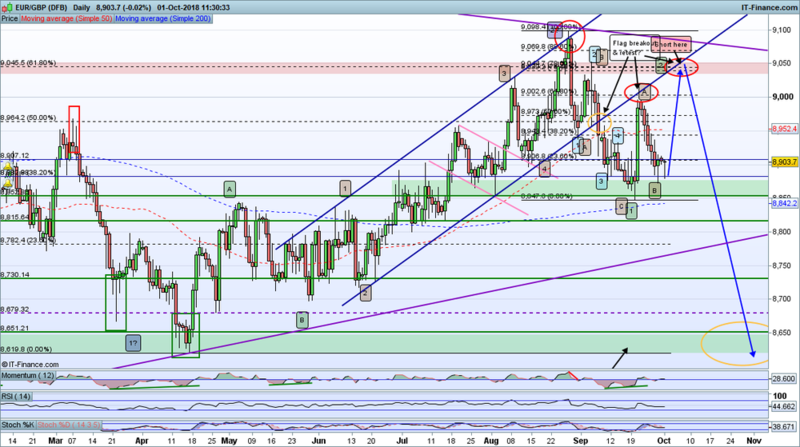 If we see a strong 1-2 bearish retrace of EUR and consolidation on GBP scenario 1 will emerge. If GBP retraces hard then scenario 2 will result. 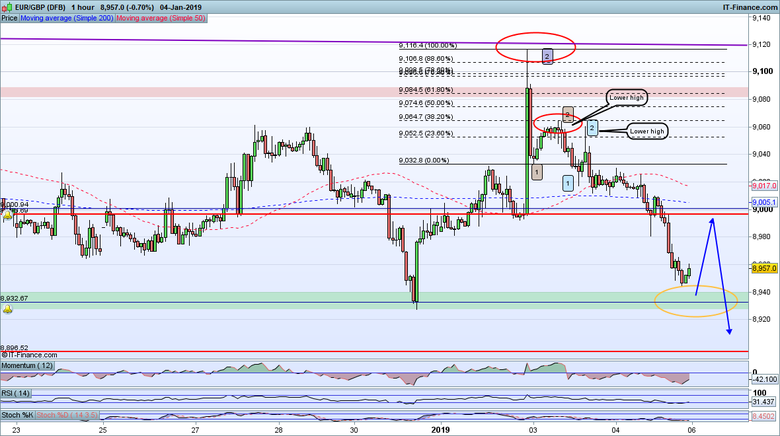 If both GBP and EUR reach my full retrace targets then EURGBP will drop away from the breakout zone and the long term bear will be on. I anticipate EUR will be much harder hit than GBP in the coming global recession. For now I am happy with multiple Shorts all stop protected above the Weekly Triangle consolidation line so mt strategy is to Short on failed retests of the breakout zone in a sell the rally mode. 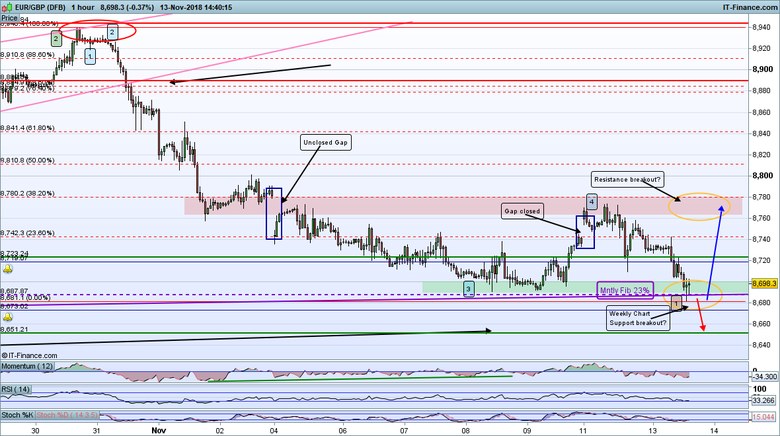 My EURGBP Short trades have been going well. My current assessment is that a major breakout to the Bearish side has occurred with the break of the Triangle. There has already been a short term retrace and retest of the Triangle so Shorts above this zone are good holds. However we could easily see another significant retrace and retest occurring over the coming retrace/consolidation continuation period that I believe will be a feature of the markets in general until the Summer. It is clear that GBP has been stronger than EUR of late but looking at the EURUSD and GBPUSD charts I see more potential for EUR rally (as in a stronger rally). Obviously if this occurs EURGBP will also rally. If we do see such a retrace any turn back off the Triangle line or breakout zone will be a very good shorting opportunity.